Background Data regarding anatomic and clinical results of flow diversion treatment in complex bifurcation aneurysms of the anterior circulation are scarce. Objective To present our results of treatment of these lesions with special emphasis on the fate of ‘jailed’ cortical branches and perforating arteries. Methods Seventeen patients were treated with flow diverters (FDs) for 18 aneurysms of the middle cerebral artery bifurcation (n=13) and the anterior communicating artery complex (n=5). Nineteen cortical branches were covered. A single FD was used in all patients. Results At latest follow-up (mean 7.9 months; range 3–36; median 4.0) 2/19 (10.5%) of the covered branches were occluded, 9/19 (47.4%) showed a decreased caliber and the remaining branches were unchanged. All branch modifications were clinically asymptomatic. Mortality and permanent morbidity were 0%. Symptomatic ischemic events in perforator territories occurred in three patients (17.6%), which were reversible in all of them within 24 h. Follow-up MRI disclosed asymptomatic lacunar defects corresponding to covered perforating artery territories in five patients (29.4%). Altogether, perforator lesions—symptomatic and asymptomatic—occurred in 7/17 patients (41.2%). 33.3% of the aneurysms were occluded at latest follow-up; decreased diameters were seen in the other 66.7%. Conclusions Flow diversion of bifurcation aneurysms is feasible with low rates of permanent morbidity and mortality. Caliber reduction and asymptomatic occlusion of covered cortical branches seems to be common, yet ischemic complications are rather linked to perforator occlusions. Our results on aneurysm occlusion rates are preliminary and longer follow-up periods are warranted. 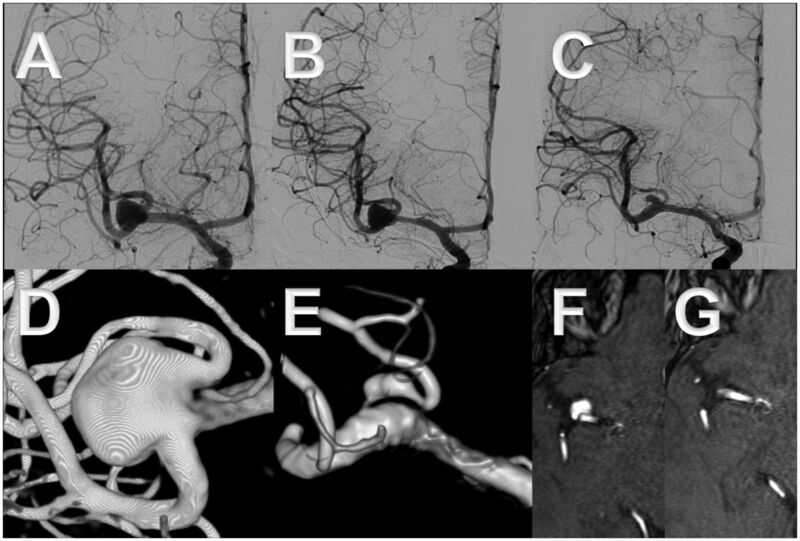 Flow diversion has emerged as a new, important strategy in the treatment of intracranial aneurysms (IAs).1 ,2 Whereas in earlier publications the majority of patients were treated with flow diverters (FDs) for large and giant aneurysms of the cavernosal and paraophthalmic/paraclinoid segments of the internal carotid artery (ICA),3–6 the indications for these devices are nowadays constantly extended.7 Data regarding anatomic and clinical results if FDs are used to treat bifurcation aneurysms in the anterior circulation—that is, at the middle cerebral artery (MCA) bifurcation and at the anterior communicating artery complex—are scarce.8–12 This study aimed to describe the results of FD treatment in these lesions at our center, with particular emphasis on the fate of cortical branches and perforating arteries when they are covered by a low-porosity device. All patients who were treated at our center with FD for reconstruction of bifurcation aneurysms in the anterior circulation beyond the circle of Willis between January 2010 and September 2014 were retrospectively reviewed. All interventions were performed under general anesthesia using a biplane flat-panel DSA unit (Allura XperFD20, Philips, Eindhoven, Netherlands). A long 6F-introducer sheath was placed in the distal common carotid artery or in the proximal ICA. Through this sheath, a 6F-guiding catheter was navigated distally in the ICA through which the respective microcatheter (Marksman, Covidien/ev3; Headway 27, MicroVention; Vasco 21, Balt) was advanced into the selected bifurcation branch over suitable guidewires. After adjunctive coiling—if necessary—the FD was delivered over the aneurysm neck with special attention to covering as few bifurcation branches as possible. At our institution, the protocol is to treat complex aneurysms by placing a single FD; additional coiling is performed in aneurysms with a diameter of ≥15 mm. After the treatment, patients were extubated in the angiography suite and then admitted to a neurovascular intensive care unit for at least 24 h.
At our institution, patients in whom stent assistance or FD delivery might be necessary are premedicated with double antiplatelet therapy at least 7 days before treatment and are then screened for resistance against clopidogrel, applying platelet aggregometry testing on the day before the procedure. When resistance occurs, a double loading dose of clopidogrel (600 mg) is immediately administered and the test is retaken on the morning of the procedure. If a patient still shows resistance to clopidogrel (Plavix), the intervention is typically postponed or the aneurysm is treated in another way. During the intervention, IV heparin is given in order to maintain an activated clotting time at about two to three times the baseline value. No heparin is given after the procedure. One-week post-procedure steroid treatment is given for aneurysms >15 mm. In the first 3–4 months, daily double antiplatelet therapy with 160 mg of acetylsalicylic acid and 75 mg of clopidogrel is maintained until the first follow-up, after which clopidogrel is usually stopped depending on the patient’s angiographic and clinical evaluation. Acetylsalicylic acid is then usually discontinued after another year—that is, about 16–18 months after the intervention. In patients with stent-assisted coiling or flow diversion therapy, follow-up consisting of clinical evaluation, DSA, and MRI is scheduled 3–4 months and 16–18 months after treatment. All patients’ DSA images of the procedure as well as available DSA and MRI follow-up studies were reviewed by the same reader (CC)—an interventional neuroradiologist with 20 years of experience. The DSA studies of the therapy session after FD delivery were evaluated for aneurysm sac filling—that is, no change in aneurysm circulation; slight slowing of circulation without contrast medium stasis; marked slowing with contrast medium stasis throughout the venous phase; or complete occlusion, inspired by a previous publication.6 Flow dynamics in the bifurcation branches that were covered by the FD were rated as having a normal antegrade flow; a slight decrease in velocity with sufficient persisting antegrade flow; a marked decrease in velocity with only a very slow antegrade flow; or as being occluded. On follow-up DSA and MRI studies, the aneurysm sac was categorized as having either an unchanged or a decreased diameter or as being completely excluded from blood circulation. In a similar way, the calibers of the ‘jailed’ branches were evaluated on DSA runs and on follow-up MRI studies—that is, as having either an unchanged or a decreased diameter in comparison with the pretreatment status or as being occluded. Our series includes 18 aneurysms in 17 patients at bifurcations beyond the circle of Willis, of which 13 aneurysms were located at the MCA bifurcation and five aneurysms at the anterior communicating artery complex. Eight aneurysms had previously been treated by coiling (n=7) and endosaccular flow disruption (WEB device, Sequent Medical Inc, n=1). The mean diameter of aneurysms previously treated with coils or flow disruption and re-treated with a FD because of a recurrence was 5.8 mm (±1.8 mm); the previously non-treated aneurysms had a mean diameter of 7.8 mm (±3.9 mm). Detailed information about patient and aneurysm characteristics is given in table 1. Two interventional neuroradiologists (CC; A-CJ) treated all patients with a single FD. The devices used were the first-generation Pipeline embolization device (PED—ev3/Covidien, Irvine, California, USA) in 10 patients; the flow redirection endoluminal device system (FRED—MicroVention, Tustin, California, USA) in five patients; and the SILK flow diverter (SFD—Balt Extrusion, Montmorency, France) in two patients. No problems in device delivery occurred. Additional coiling of the aneurysm sac was performed in one patient (5.9%) (figures 1⇓⇓–4). A middle-aged patient presented with headaches and an unruptured right middle cerebral artery bifurcation aneurysm. The upper branch emanates in a steep angle from the aneurysm neck, which made catheterization difficult (A, B, D, F). The aneurysm was treated by placing a SILK flow diverter into the lower branch without adjunctive coiling. The latest follow-up after 36 months shows complete disappearance of the aneurysm and remodeling of the upper branch (C, E, G). 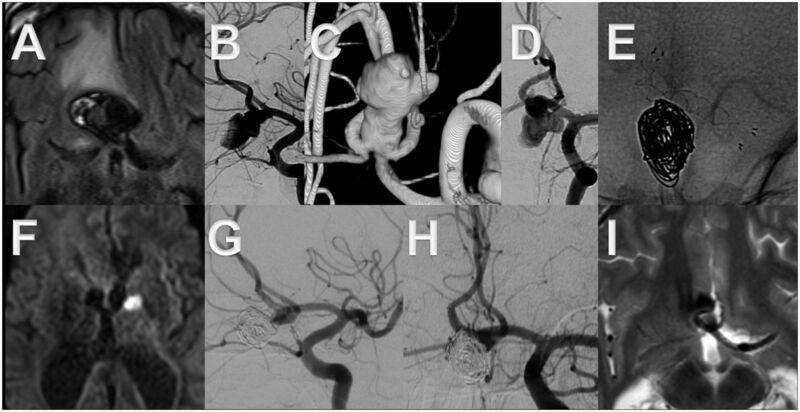 This middle-aged patient presented with acute subarachnoid hemorrhage (World Federation of Neurosurgery 1) owing to a large aneurysm of the left middle cerebral artery bifurcation, which was treated by incomplete balloon-assisted coiling in the acute phase (A–C). 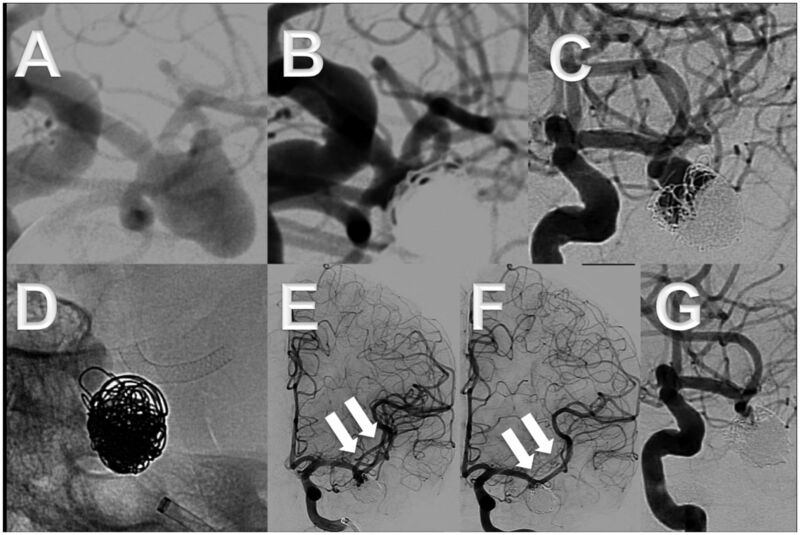 Ten months later, the residual aneurysm (D) was treated by placing a flow diverter (Pipeline embolization device) into the lower bifurcation branch (E). Compared with the status directly after the intervention (F), the aneurysm was completely cured after 4 months (G). Note the reduced caliber of the covered upper branch in (G). Seventeen days after treatment the patient developed an acute hemihypesthesia owing to occlusion of a covered perforating lenticulostriate artery (H, I), with completely reversible symptoms within 24 h.
A patient in the fifth decade of life presented with visual loss of the left eye owing to compression of the optic chiasm by a giant, partially thrombosed aneurysm of the anterior communicating artery (A–D). Treatment consisted of placing a flow diverter ( flow redirection endoluminal device) from the left A1 to the right A2 segment and additional coiling of the aneurysm sac (E). After 4 months the aneurysm was almost completely occluded except for a small neck remnant (G–I). Three days after the procedure the patient had a sudden facial paresis. MRI depicted a stroke in the left internal capsule, which was probably caused by an occlusion of the recurrent artery of Heubner (F). However, all symptoms were reversible within 24 h.
This elderly patient's (seventh decade) left middle cerebral artery bifurcation aneurysm had ruptured 3 years previously (World Federation of Neurosurgery 2) and was treated in the acute phase by applying the balloon remodeling technique (A–C). The aneurysm recurrence (C) was treated by placing a Pipeline embolization device into one bifurcation branch (D). After 4 months only a very small neck remnant was still present (G). Note the caliber reduction of the upper bifurcation branch (arrows in E and F). Short-term follow-up DSA and/or MRI after 3 or 4 months was available for all 17 patients. The mean follow-up time in these patients was 7.9 months (range 3–36; median 4.0). In 5/17 patients (29.4%), further follow-up studies beyond the short-term period were available. Nineteen bifurcation branches were covered (‘jailed’) by FDs. Three ‘jailed’ bifurcation branches were occluded immediately after FD delivery (15.8%), whereas three branches (15.8%) showed a slowed blood flow and the remaining branches were unchanged. it should be noted that all branch occlusions were asymptomatic, as the supply of their cortical territories was taken over by leptomeningeal collaterals in all cases. At the latest follow-up, 2/19 covered branches were occluded (10.5%). One of them was already occluded immediately after delivery of the FD; the other showed a normal filling periprocedurally. Of the two other branches with an immediate occlusion after FD delivery, one showed a normal and the other a reduced caliber at control DSA. At latest follow-up, 47.4% (9/19) of the covered branches showed a decreased caliber and the remaining 42.1% (8/19) were unchanged. Immediate and follow-up anatomic results are summarized in table 2. No deaths or permanent morbidity occurred in our single-center series. Symptomatic periprocedural complications within the first week of the intervention occurred in one patient, with an acute ischemic stroke (facial paresis) of the recurrent artery of Heubner 3 days after the treatment, which had consisted of covering the ipsilateral A1, the anterior communicating artery, and the contralateral A2 by a FRED owing to an anterior communicating artery aneurysm. His symptoms were completely reversible within 24 h. Symptomatic delayed complications were seen in two patients. In one patient, a transitory ischemic attack with 20 min of hemihypesthesia occurred 6 months after treatment; MRI showed an acute perforator stroke. In the other patient with sudden onset of hemihypesthesia 17 days after treatment, a stroke of a lenticulostriate artery was diagnosed on MRI; these symptoms were also completely reversible within 24 h (table 3). Follow-up MRI showed new clinically asymptomatic lacunar defects in 5/17 patients (29.4%). 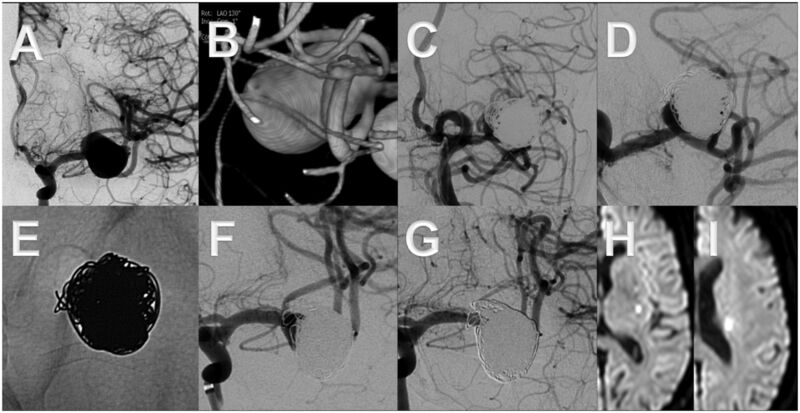 Periprocedurally, an asymptomatic subtle subarachnoid bleed and contrast medium collection was discovered on systematic post-procedure cone beam CT in one patient probably due to wire tip perforation of a distal MCA branch. Additionally, signs of residual sulcal hemosiderin were detected on the first control MRI of another patient after 4 months. Thus, one has to consider one more hemorrhage of unknown origin. Owing to a very distal localization, a periprocedural wire tip perforation was considered highly unlikely and this finding considered as remote subarachnoid bleeding. Symptomatic ischemic events with neurological deficits were seen in 3/17 (17.6%) patients—in one (5.9%) of them transient (<1h) and in two reversible within <24 hours (11.8%). All these events were caused by perforator strokes. Asymptomatic lacunar defects in territories corresponding to perforating vessels emanating from the arteries, which were covered by a FD, were detected in 5/17 patients (29.4%). Altogether, lesions in perforating artery territories—both symptomatic and asymptomatic—were discovered in 7/17 patients (41.2%). Notably, no cortical ischemia was noted on cross-sectional imaging studies. Immediately after implantation of the device an occlusion was seen in 2/18 aneurysms (11.1%). On the latest follow-up, six aneurysms (33.3%) were occluded; decreased sac diameters were seen in all other patients (66.7%). Our single-center study shows that flow diversion treatment of complex bifurcation aneurysms can be effected with low risks of permanent morbidity and mortality. Symptomatic ischemic events were seen in three of our 17 patients (17.6%)—in one (5.9%) of them transient (<1h) and in two reversible within <24 hours (11.8%). Interestingly, none of these events was related to occlusion or slow perfusion of a large cortical branch that was ‘jailed’ by the FD but to ischemia of perforating arteries. The observation that covering large cortical branches by low-porosity stent systems is well tolerated by most patients corroborates the results of previous studies.8–12 This might be explained (a) by pial collaterals, which can take over the supply of the covered branch through retrograde filling and (b) by prolonged patency of the ‘jailed’ artery if a flow demand is present, mediated by a higher pressure gradient.5 ,8 The impact of flow diversion on the patency of covered side branches has also been investigated in several experimental studies.15–17 It was shown that covered branches usually stay open for up to 12 months, although neointima tends to partially cover the ostium of a ‘jailed’ artery. Moreover, a study applying computational fluid dynamics concluded that FDs seem to be safe for perforator or side branch occlusion and that only small changes in flow rates have to be expected.18 Nevertheless, we noted a large number of covered side branches that were either occluded or reduced in diameter at follow-up. This type of remodeling has already been observed by other groups and seems to be common—that is, some branches may stay unchanged, but a large number will undergo a subsequent decrease in diameter or asymptomatic occlusion.8 ,9 Owing to the limited number of patients, we could not identify factors on perioperative DSA, which might predict the likelihood of side branch occlusions as branches that were initially patent were found to be occluded at follow-up and vice versa. In addition to the above-mentioned symptomatic ischemic events, new post-ischemic asymptomatic lesions in perforator territories, whose emanating branches were covered by FDs, were detected in 5/17 patients (29.4%) on follow-up MRI studies; altogether, perforator lesions—both symptomatic and asymptomatic—were detected in 7/17 patients (41.2%). It is known that silent brain infarcts are often lacunar lesions of perforating arteries,19 and the fact that they do not necessarily evoke clinical symptoms is probably attributable to non-strategic localizations.20 This is in contrast to the posterior circulation where higher rates of clinically apparent perforator strokes are reported; for example, in a series by Kulcsár et al,21 delayed symptomatic ischemic events related to perforating artery occlusion were seen in 3/12 patients with basilar artery aneurysms treated with the SILK FD. The authors discussed the patency of perforating arteries when covered by a low-porosity device and questioned whether the results of the above-cited experimental animal studies could be extrapolated to the human vasculature. Most importantly, they noted that there is a discrepancy between the size of the covered large animal arteries and human perforators of the brainstem, which are barely visible or not visible on DSA. This remark applies similarly to MCA perforators, which have a wide range of calibers between 80 and 1400 µm; moreover, they are end-arteries so that their occlusion will lead to an ischemia owing to the lack of compensation mechanisms by collateral flow.22 ,23 The reported ischemic complications led Kulcsár et al21 to conclude that FD treatment of intracranial aneurysms of the basilar artery should be restricted to (a) patients with lesions, otherwise not amenable to treatment or (b) patients with progressive recurrence after treatments with current endovascular modalities. In our opinion this conclusion also applies to complex lesions located at bifurcations of the anterior circulation. Complete occlusion was achieved in 33.3% of the aneurysms in our series, which is a small percentage compared with similar recent studies, in which complete occlusion was reported in 97.3%,9 84%,8 77.8%,12 or 82.6%.11 However, most of those papers had longer follow-up periods. For example, in the report by Saleme et al9 DSA after 18 months was available for 100% of patients and in the report by Pistocchi et al11 the mean follow-up period was 13 months. Also, the first follow-up in our study was conducted after 3–4 months when most of our patients were still being treated with clopidogrel. These short-term studies were the only controls for 71.6% of all patients followed up and must surely have contributed to the low occlusion rates. A Spanish–American multicenter study showed that 6 months after treatment of bifurcation aneurysms using FDs, occlusion rates were as low as 64%.10 Yavuz et al8 emphasized in their series that after 1–3 months a decrease in aneurysm diameter can be expected, whereas complete occlusion begins at about 6 months and might take up to 18 months. Their assumption is corroborated by the above-mentioned clinical studies and also by preclinical research on canine aneurysms.15 ,24 Although clinical results disproved the statement made by Darsaut et al15 (that FDs fail to occlude bifurcation aneurysms), the deduction from these experimental studies is that a branch emanating from the aneurysm may hinder intra-aneurysmal blood stasis, which seems to be necessary for a fast thrombosis and subsequent cure. But instead of impeding complete cure, the ‘healing process’ may just take longer than usually found in ICA aneurysms,3–5 and persistence of sac filling might eventually be more of an exception than the rule under clinical conditions.5 ,8 ,12 As all aneurysms in our study showed either a decrease in diameter or a complete occlusion at the latest follow-up, it seems that a degree of ‘remodeling’ was initiated in all of them. However, further reports on the long-term results in our patients after at least 18 months will be necessary to demonstrate if this initial ‘remodeling’ eventually leads to complete aneurysm cure. The main limitations of this study are its retrospective design and the small number of patients. Further studies on larger patient groups and retrospective analyses of larger registries with long-term recordings of patient outcome and anatomic results therefore seem justified. The long-term results for our patients will be reported as soon as possible. In summary, flow diversion of complex bifurcation aneurysms in the anterior circulation is feasible with low rates of permanent morbidity and mortality. Covered branches frequently undergo remodeling after the procedure with asymptomatic branch occlusions and caliber reductions being common. Symptomatic ischemic complications seem to be linked to occlusions of perforating arteries rather than ‘jailed’ cortical branches. Moreover, asymptomatic perforator lesions were often detected. Our results for occlusion rates are preliminary and longer follow-up periods will be necessary to conclude if the applied treatment is as effective for aneurysm cure as previously reported. MG and A-CJ contributed equally. Contributors MG: substantial contributions to the conception or design of the work; analysis and interpretation of data; drafting the work; final approval of the version to be published; agreement to be accountable for all aspects of the work. A-CJ, PT, FB, CC: substantial contributions to the conception or design of the work; acquisition, analysis, and interpretation of data; final approval of the version to be published; agreement to be accountable for all aspects of the work. Data sharing statement Additional information or image material are available on request to the senior author.